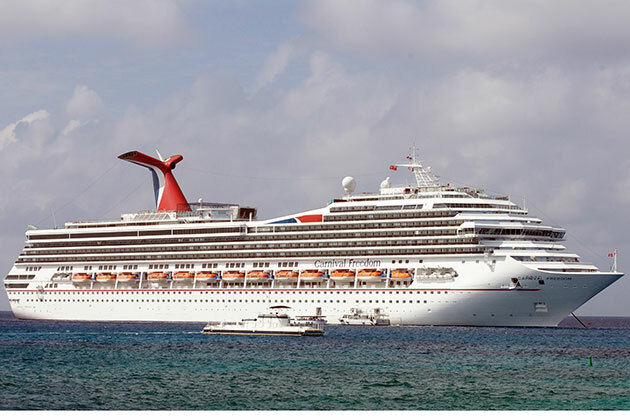 Multigenerational cruising, where you bring the whole darn family, is not only accommodated but embraced wholeheartedly on Carnival's refurbished Freedom. It works because there are separate spaces for adults, teens, kids and even babies, as well as communal areas dedicated to family time. 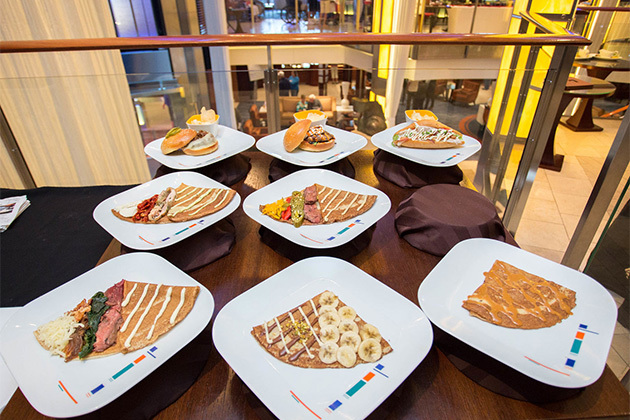 The clincher is you don't even have to have kids to enjoy this 2,974-passenger ship; cereal-coated French toast tastes just as good to adults. 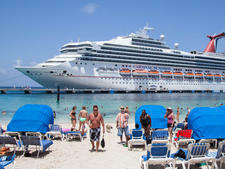 Here are five cruise tips to see and experience the best of Carnival Freedom. Plenty of new cruise ships have smorgasbords of specialty dining options, but many slap you with additional cover charges. Freedom keeps things simple: Unless you choose a night out at Sun King, the upscale steakhouse, or drop by the a la carte Viennese Cafe for a specialty coffee and a pastry, everything is free; nickel-and-diming is kept to a minimum onboard. While the breakfast burritos and salsa bar at BlueIguana Cantina are a standout, the buffet (called Freedom Restaurant) offers enough variety to cover a full sailing. Specialized stations, such as the Mongolian Grill, Carnival Deli or Pizza Pirate, cater to late-night urges and international tastes. 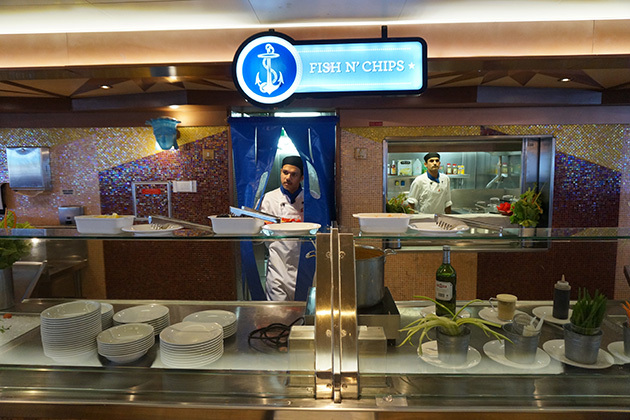 Our recommendation is Fish & Chips, located one deck up from the buffet, on Deck 10. Each selection comes in tasting-size portions, so it's doable to order everything on the menu and split it between two people for a full lunch. Try the seafood ceviche. Dr. Seuss is on the loose onboard Carnival Freedom, with a character parade, Story Time, a dedicated Bookville reading room for families and, of course, a Green Eggs & Ham breakfast. The activities are meant to engage young and old alike, but without kids, it might feel a tad creepy to be clanging noisemakers into the atrium with a stranger's toddler by your side. If you find yourself feeling a little green -- with envy -- over the character breakfast, you can either fork over five dollars and join the kiddos (no judgment here!) or enjoy one of the more popular dishes among adults at the Seaday Brunch. 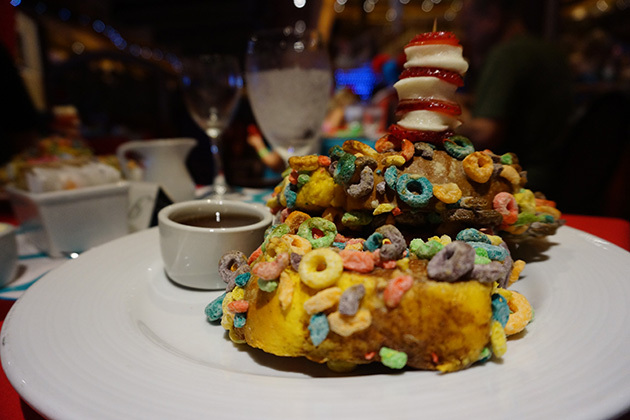 Offered as one of the brunch options each sea day in one of the main dining rooms, sugary cereal-coated French toast becomes a highbrow confection among fine linens and ocean views (although you miss out on posing with a 7-foot-tall cat in a hat). 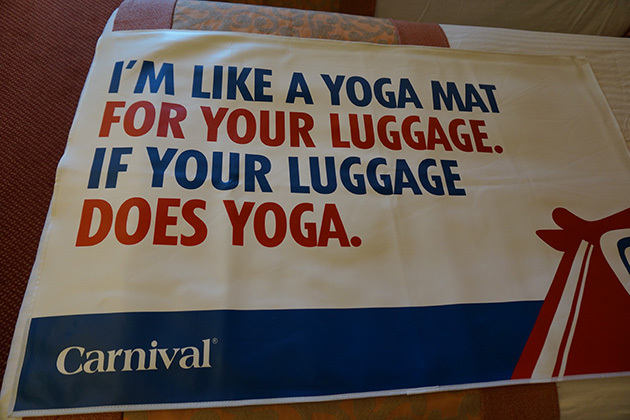 From the wisecracking welcome mat on your bed when you arrive to the silly signage around the ship, a carefree vacation mentality is required upon embarkation. Freedom hosts a live game show based on board games (Hasbro, the Game Show) and comedy for all ages, as well as poolside contests and towel-folding demonstrations. 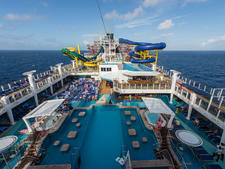 It's easy to reconnect with the happy-go-lucky kid in all of us, even if you didn't bring an actual kid on the cruise. 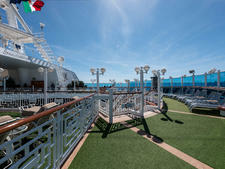 If embracing adulthood is what you prefer on your cruise, however, head to Serenity, the 21-and-older space on Decks 12 and 14. (There's no Deck 13.) Ironically, the adults-only sun deck is located near the kids club, but amidst the tropical drinks, hammocks and hot tubs, you won't notice. With drinking outlets for rum and tequila, a pub with craft beer and plenty of other social spaces, nightlife on Freedom never runs dry. 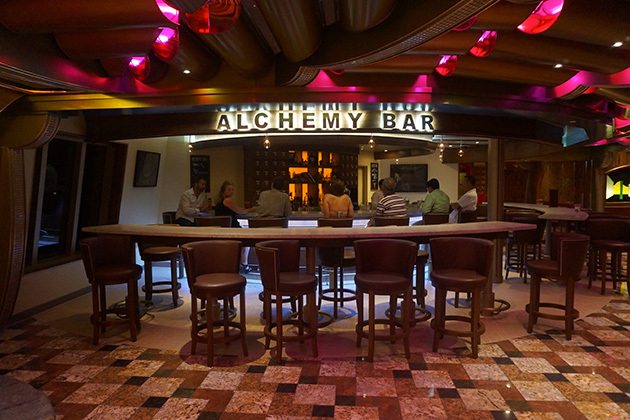 However, we recommend a stop at Alchemy Bar, on Deck 5, retrofitted into a corner of the promenade. While smaller on this ship than on others in the fleet, Alchemy Bar brings a bit of big-city refinement to the ship with trendy handcrafted libations. Mixologists in white lab coats suggest "prescriptions" from an electronically illuminated menu, or you can play doctor by grabbing a pad and concocting your own. The bartenders are quite knowledgeable and entertain as well as educate with flourishes like burning orange peels. For something between sweet and herbal, select the strawberry- and rosemary-infused Perfect Storm. Despite the sophisticated atmosphere and showmanship, the space is rarely crowded. The nightly theater shows -- Playlist Productions -- only last 30 minutes, and this is on purpose. 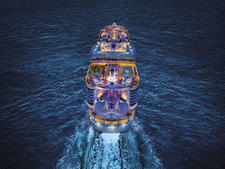 Everything about the evening entertainment is designed so you can fit it all into one cruise or possibly even an evening. Production shows in the theater and comedy at the Punchliner Comedy Club are staggered, and mealtimes in the main dining room have early and late seatings to accommodate nighttime festivities. 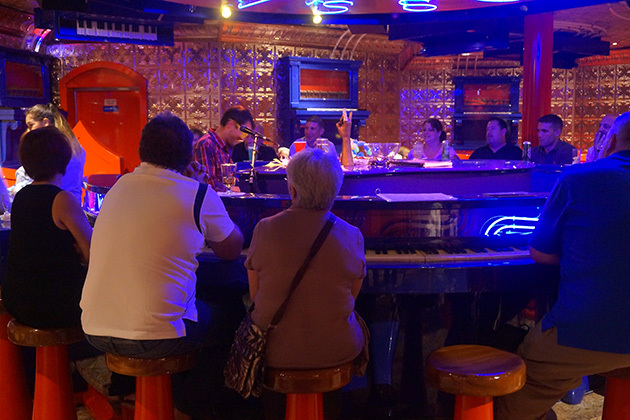 Theme nights, the piano bar and dance club all run until the wee hours, so those who want to cram action into every moment will find no problem doing so.